International Olympic Committee insist they have confidence in British authorities after third night of rioting. LESS THAN A year before London hosts the 2012 Games, scenes of rioting and looting a few miles from the main Olympic site have raised concerns about security and policing for the event. Images of buildings and vehicles in flames broadcast around the world are also poor publicity for the capital as it prepares to stage the games for a third time. The unrest, which started Saturday night in the Tottenham area of north London after a police shooting, spread closer to the Olympic complex yesterday when scattered violence broke out in the Hackney area of east London. “You can imagine how stretched the police would be if this were to occur during the Olympics,” said Tony Travers, a local government expert at the London School of Economics. “So I think this will create a worry within City Hall and the Home Office. 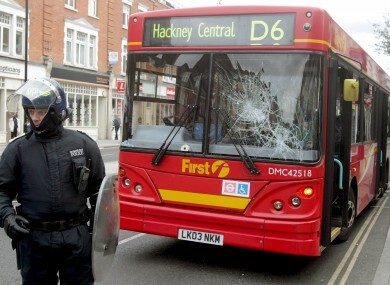 Groups of youths, many wearing hoods and masks, attacked shops and windows in Hackney. Police in riot gear were pelted with pieces of wood and other objects. The government said more than 200 people had been arrested and more than two dozen charged over three days of trouble. Police said at least 35 police officers were injured. Sports also felt the impact, with two soccer matches called off because police needed to focus its resources on the violence. East London’s West Ham said police told it to postpone the League Cup match against Aldershot on Tuesday because “all major public events in London were to be rearranged,” while south London side Charlton said its cup match against Reading was being called off “on safety grounds” on advice from the police. This morning, the FA confirmed England’s international friendly with Holland was off also. Hackney is one of the five boroughs encompassing the Olympic Park, a one-square-mile site that will be the centerpiece of the games, which start on July 27, 2012. Last night’s violence took place about four miles from the park. The park includes the Olympic Stadium, which will host the opening and closing ceremonies and track and field competition, as well as the velodrome, aquatics center, basketball arena, handball arena and main press and broadcast center. Other Olympic venues are located at various sites around the capital, including Hyde Park (triathlon), Horse Guards Parade (beach volleyball), Wembley Stadium (football) and Wimbledon (tennis). There has been no violence in those areas. For civic leaders and Olympic organizers, the violence was an unwelcome reminder of London’s volatility, less than two weeks after the city celebrated the one-year countdown to the games with great fanfare. The International Olympic Committee said it had confidence in British authorities. The London organising committee for the Olympics, declined to comment on the trouble, in what appeared to be an attempt to avoid making any links between the violence and the games. Email “What does the rioting mean for London 2012? ”. Feedback on “What does the rioting mean for London 2012? ”.